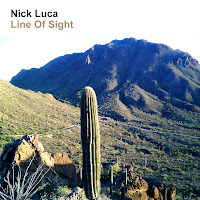 New album by Nick Luca called "Line of Sight". This is an homage to my years as a musician and desert dweller in Tucson, AZ. "Line Of Sight" is Instrumental Soundtrack Desert Noir. Download for sale at www.nickluca.bandcamp.com and you can stream it in it's entirety at www.nickluca.com (all proceeds go directly to the artist, yay!). Hope you enjoy! ©2015 Loquacious Guru. Watermark theme. Powered by Blogger.